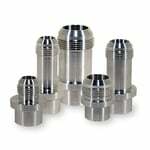 Custom water neck fitting for LS1, LS2, LS6, and LS7 style engines. This water neck is machined here in the USA from a solid piece of 6061-T6 aircraft grade billet aluminum. It presses in place of the factory steel push in piece accepts a AN fitting. Simply pull out the factory 1.5" barbed fitting and press or weld this unit in place. The press in fitting is available in a short -16AN and -20AN version as well as a long -16AN and -20AN version. The fitting itself is available with a 1.299" base (GM pumps) and 1.310" base (aftermarket pumps). Please specify which version and size your application requires. It will also work with many of the 4.8L, 5.3L, or 6.0L truck water pumps. Q: Looking at this product (as well at the thermostat housing) for a street car application. Supercharged LS3 in a 63 Nova. Not sure if I should use the -16 or -20 adapters. Will the -16 flow enough coolant for my application? Hi,you can technically use either -16an or -20an. -16an will work fine if you are keeping the radiator up front. If you were to relocate the radiator to the back of the vehicle, we would highly recommend a -20an. Most people run the -20an just to be safe since it is closer to the factory size hose. Also make sure your water pump flows enough gallons per hour for your application. Thanks. Q: Thank you! What method do you recommend for pulling the original water neck off? Hi, remove the 2 bolts, then lift straight up and out. Thanks. Q: For CBM-10622 the description states that Genuine OEM water pumps will fit. I have an ACDELCO water pump but I didn't purchase it from Chevy. Is CBM-10622 the correct adapter for me? As long as you know the brand is truly AC Delco, it doesnt matter where it was purchased. The CBM-10622 would be the correct part for your application.